Scientists can infer a rat's location based on which place cell -- found in the brain region called hippocampus -- sends signals. However, sometimes the place cell that is active does not correspond with the rat's current location. "This gives us an insight into what the animal is thinking about space," says Jozsef Csicsvari. "We used this concept to understand how rats think during tasks that test their spatial memory." In the experiments, rats navigated through a maze with eight arms. Three arms contained food rewards. The rats revisited the maze so that they formed memories of where the rewards were hidden. This task teases apart two different forms of spatial memory: reference and working memory. Reference memory is the memory that allows a rat to remember which arms contain rewards, and which arms don't. Working memory is the memory that keeps track of which arms the rat hasn't been to yet and which ones it has already visited, so that the rat doesn't make unnecessary trips. The researchers can test pure working memory by modifying the experiment so that only arms that contain rewards are open, or pure reference memory by closing off arms that have been visited already. 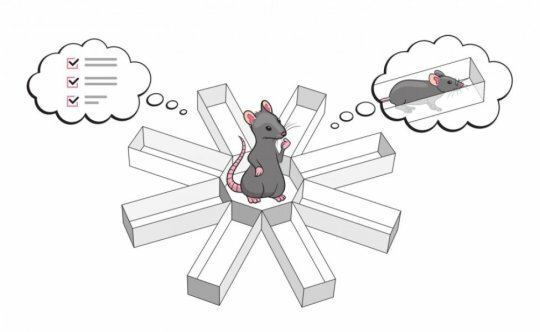 The researchers then asked: how do place cells fire when rats navigate a maze, and how does firing differ between reference and working memory tasks? At the center of the maze, before the rat enters the next arm, the sequence of place cells that fire corresponds either to the route the rat took in the last arm it visited, or to the arm it is going to run down next. In tasks testing reference memory, the sequence corresponds to the next maze arm the rat will visit, giving the researchers a glimpse into the rat's immediate plans. "The animal is thinking about a different place than the one it is in. In fact, we can predict which arm the rat will enter next," Csicsvari explains. Not only can the researchers predict where the rat will go next, they also know when the rat will make a mistake, says Csicsvari: "When the rat makes a mistake, it replays a random route. Based on the place cells, we can predict that the rat will make a mistake before it commits it." However, the prediction fails in working memory tasks. In tasks that test only working memory, the firing pattern instead replays the last arm that the animal visited.